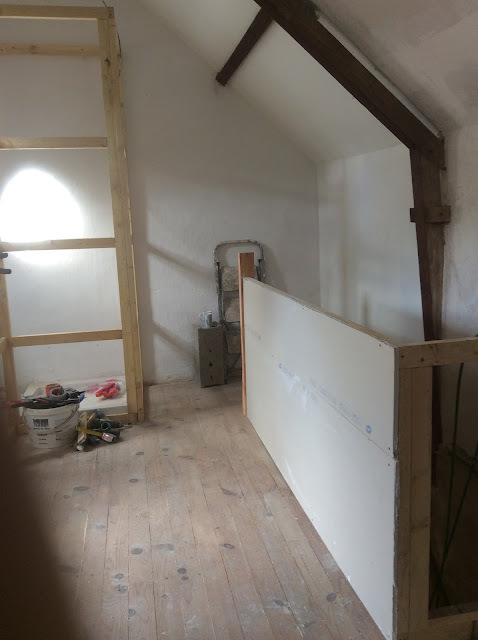 The stairs and newel post are in place, so now we need to decide how we are going to make the opening safe. We had planned on having spindles and a handrail, but this would be quite costly as we have used all of the spare wood from the stairs. Plus it would not be very private for the bedroom. A bit of head scratching later and we have decided to build a small parapet wall around the opening. This will be just high enough to keep the room private, but not too high that it will feel closed in. The wood studding is put in place and plaster board added. Once finished John will use a piece of reclaimed wood to make a handrail. This will be stained the same colour as the joists in the room.